Mosquitoes are attracted to the scent of your skin, the scent of your sweat, and the carbon dioxide you exude. When you are attracting those mosquitoes, that simply means that you are sending out the message to those mosquitoes that your blood is just right for her eggs. 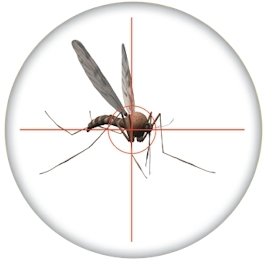 Mosquito & Pest Xperts not only utilizes the premier and most effective solutions in the marketplace today, but our professionally trained applicators specialize in Mosquito Control techniques. Here are some facts to help you understand what’s happening in your environment. Mosquito & Pest Xperts will make your outdoor activities fun again without the mosquitoes, no-see-ums or other biting insects. The secret is our maintenance-free, fully automatic misting system. Only female mosquitoes bite, and all mosquitoes live on the sugar found in plant nectar, not on blood. But there is a reason females seek blood. Female mosquitoes, unlike males, have a proboscis. This is a long thin needle-like built-in syringe located at the mouth. They use this to impale their victims, in order to fill their abdomens with blood. Proteins in the blood are necessary to produce fertile eggs. Since males cannot produce eggs they have no need for blood. Females require a new blood ‘meal’ for every nest they lay, and produce about 250 eggs per meal. Aren’t you glad your mosquito bites are so productive? Mosquitoes can lay their eggs in a thimble full of water or the dew created in the leaves of a magnolia tree. Any insignificant measurable amounts of water, in bird baths, old tires, tin cans, lingering puddles of rain, gutters, catch basins, tree cavities, pine cones or basically any place that can hold water, can create harborage sites for mosquitoes. The eggs may hatch in less than 3 days, and the entire mosquito life cycle, from egg, to pupa, to larva to adult, can be completed in 4-9 days. The eggs of some species are more resistant to drying out than others; some even require drying out before subsequent flooding can induce them to hatch. These are the ones that can survive even the harshest drought, finally hatching when water is again introduced. There are about 200 different species of mosquitoes found in the United States. Different species of mosquitoes have specific feeding preferences with regard to prey types (e.g., some prefer to bite birds, some prefer to bite mammals, and others prefer animals of other kinds). As of 2005, 60 different species have been linked to the spread of West Nile Virus. The Mosquito is the most dangerous insect pest to man. Most species of mosquitoes are harmless. However, several species carry and transmit diseases. Mosquitoes are the only agents that carry and transmit malaria, yellow fever, dengue fever, and filariasis to man. They are the leading agents in transmitting several forms of viral encephalitis. 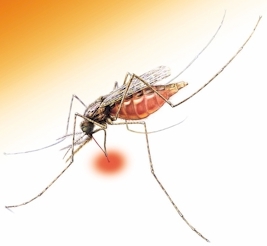 Mosquitoes also transmit certain diseases to animals. West Nile virus is a disease normally found in Africa, West Asia and the Middle East. Only recently has its occurrence been documented in the United States. This virus is associated with birds and can be transmitted to human populations through mosquito bites. Mosquitoes become infected when they feed on infected birds. The infected mosquitoes can then spread the virus by biting humans and other animals, such as horses. First appearing in the U.S. in 1999, the West Nile Virus has now spread through most of the country. North Carolina found its first case in a bird in 2000 and its first human case in 2002. Symptoms occur five to 15 days after infection and may include fever, headache and body aches, which may be accompanied by skin rashes and swollen lymph glands. In more severe cases, disorientation, coma, tremors and paralysis can occur. This disease is rarely fatal; the elderly are most at risk. There is no vaccine for West Nile Virus. According to the North Carolina Department of Health and Human Services, the best way to avoid West Nile virus is to prevent mosquito bites. If you would like to take the first step towards mosquito and pest free living! It is very important to work with a trained professional in the area of Mosquito Control to make sure your yard is free from mosquitoes, but more importantly, to ensure that the proper mosquito treatments and solution are being applied by licensed applicators according to the laws of your state. A mosquito may lay a raft of eggs every third night during its life span. Culex mosquitoes lay their eggs one at a time, sticking them together to form a raft of from 200-300 eggs. If that mosquito is lucky enough to live 4 to 6 weeks, you can do the math. No wonder there are so many of them. Some mosquitoes can lay up to 3,000 eggs in her short lifetime.